The term 'nebula' is a Latin word which means 'cloud'. 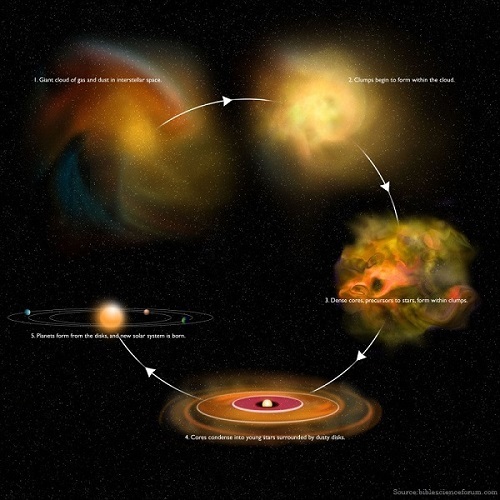 The Solar Nebula Theory postulates that the Solar System is formed by the transition from an undifferentiated cloud to a star system and then completed with planets and moons around 100 million years ago. This theory states that the Solar System was formed in 4.6 billion years ago by condensation. It is moving around three observable facts- first is that all the planets rotate in the same direction; second is that all the planets orbit within six degree of a common plane; and third is that all the terrestrial planets are situated within the orbit of the Asteroid Belt whereas those outside it are gaseous. This theory also supports the existence of the Kuiper Belt (Belt of high concentration of comets). Stages of the formation of Solar System according to the Solar Nebula Theory: Cloud Collapse > Formation of Protoplanetary disk > Growth of planets. According to the Solar Nebula Theory, the formation of the solar system was started when an interstellar cloud, containing approximately 75 percent hydrogen, 25 percent helium and traces of other elements, begins to form areas of higher concentration, or clumps. During the clumps expansion, the gravitational forces increases and transform into kinetic energy of the increasingly fast moving particles that collide with each other and generate heat. After an unspecified period of time or an especially long delay one clump dominates, and when its temperature reaches 10 million degrees Kelvin (18 million degrees Fahrenheit), nuclear fission begins. The outward pressure created by the fission reactions prevents further collapse, and the clump of burning hydrogen gas stabilizes and becomes a star. After the collapse of a cloud, the Protoplanetary disks were formed which is also called proto-stars. The gases in the nebula from which it is born, form a disk. Then after an unspecified period of time or an especially long delay, the outskirt of the disk started to form balls like structures with composition. The composition of this ball like structures depends on their distance from the centre. Over the time these balls like structures collide with each other to form spherical bodies under the process of the accretion. These larger bodies are called planetesimals or celestial bodies. After the formation of planetesimals or celestial bodies, continue to grow by assimilating surrounding material, including smaller planetesimals, to become planets. Next Story What is Western Disturbance and its impact on the Indian subcontinent?